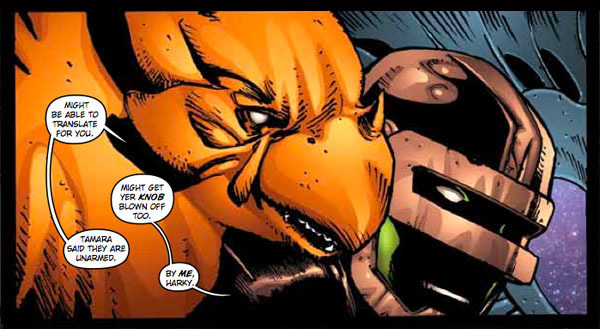 Independently created comics are a great contrast to the “capes” stories that some of the bigger publishers thrive on. 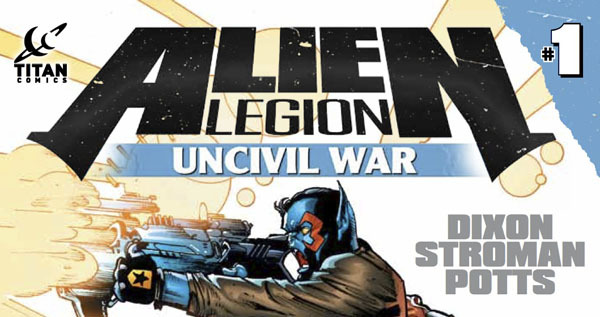 Titan Comics’ new book; Alien Legion: Uncivil War from the creative team of Chuck Dixon, Larry Stroman and Carl Potts gives us a space opera that features a gang of intergalactic peace keepers. While it suffers from some timing and pacing issues, this is a book that shows a lot of promise not only in its storytelling but in its world and characters. Set in deepest reaches of space, Alien Legion: Uncivil War follows a band of peacekeepers as they, you guessed it; keep the peace. Traveling from planet to planet when the need arises, the team consisting of members from a half dozen different planets all come together for the greater good. Issue #1 takes the team to the planet Harkilon, after a series of refugees are attempting to escape their civil war-torn planet. The team are met with hostility upon their arrival and eventually have to perform such tasks as fending off wild creatures and helping a queen to give birth. The story does suffer from some pacing and timing problems in this first issue, but hopefully after we are fully introduced to the main characters and the universe itself, this will smooth out. The book can at points be really difficult to read. 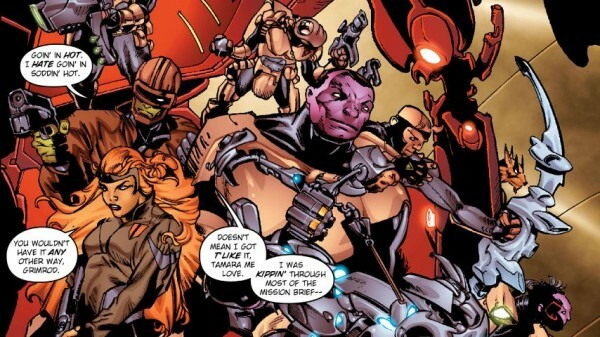 To help build this universe and its characters, Dixon, Stroman and Potts have created an entire language of colloquialisms, idioms and brand new words. As readers we are thrown into the deep end and told to swim for our lives. It feels a little like you are going on holiday overseas – the names and places seem right, but there is the occasional word or phrase that just makes you stop and wonder what the heck is being said. It really helps to build up this universe and make it feel alive and authentic. Luckily, the final few pages of the book also contain a glossary of some of the more commonly used words and phrases. Re-reading the book after you have glanced over the glossary terms is really a new experience in of itself, so you are kind of getting two books for the price of one. 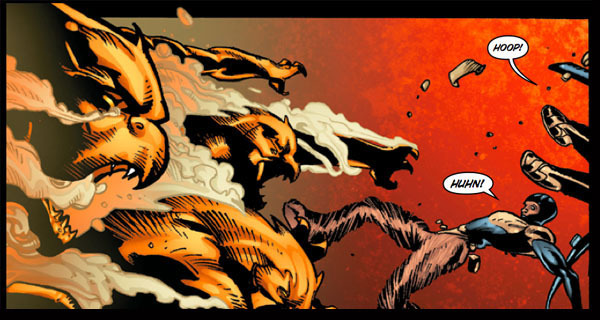 Alien Legion: Uncivil War has a relatively average art-style. Nothing really leaps off the page but at the same time it is always interesting to look at. The colour pallet is mostly comprised of earthy tones like brown and dull green which give a very gritty and dark feel to the whole book. As with most space-opera styled pieces, the world is filled with creatures of varying shapes and sizes. Despite the weird and wonderful universe that Alien Legion is set in, the team that the book follows are all pretty much humanoid. Don’t get me wrong though, every character is worlds apart from one another. Of the five characters that are introduced to us in the beginning of the book, only three of them actually look like people. The rest, be they commander Sarigar with his bright blue skin and red markings, or Jugger (who looks like a cross between Juggernaut and The Hulk) everyone looks weird, wonderful and unique. While there is nothing wrong with the art style, it does feel a bit lacking. In the modern age of comic books we have artists like Jim Lee doing really clean and crisp (and insanely detailed) pages, and then we have people like Justin Randall doing really amazing things with the medium, it just makes this typical “comic-book” art style feel a little dated. 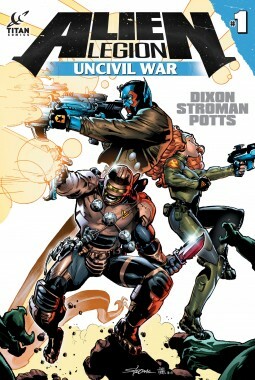 Alien Legion: Uncivil War #1 marks the beginning of a new story, a new world and new characters in comic book history. The space opera style really fits right at home on the printed page, and the writing although hard to wrap your head around at first really makes the book feel authentic and alive. While it doesn’t have the most stand-out artwork and suffers from some timing issues, I am really excited to see where the creative team can take this bad boy.